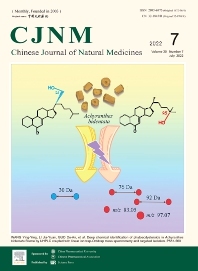 The Chinese Journal of Natural Medicines (CJNM), founded and sponsored in May 2003 by China Pharmaceutical University and the Chinese Pharmaceutical Association, is devoted to communication among pharmaceutical and medical scientists interested in the advancement of Traditional Chinese Medicines (TCM). CJNM publishes articles relating to a broad spectrum of bioactive natural products, leading compounds and medicines derived from Traditional Chinese Medicines (TCM). Topics covered by the journal are: Resources of Traditional Chinese Medicines; Interaction and complexity of prescription; Natural Products Chemistry (including structure modification, semi-and total synthesis, bio-transformation); Pharmacology of natural products and prescription (including pharmacokinetics and toxicology); Pharmaceutics and Analytical Methods of natural products. Authors should submit their manuscripts online at http://mc03.manuscriptcentral.com/cjnm, or by email to the Editorial Office, China Pharmaceutical University, at cjnm@yahoo.cn.